The Lindy’s Football Report for Week 11 is up! November 08, 2018 at 1:50 pm. Lindy’s Football Report if back for its sixth season. Our 30-minute weekly radio show will continue through mid-December. Sponsored by Gordo’s Cheese Dip, Powerade, Sam’s Club, U.S. Farm-Raised Catfish, Coca-Cola and All-Spice Cafe and supported by our ticket partner, Ticket City, the show discusses games and topics impacting college football nationally with emphasis on the SEC. Co-hosts for the show are long-time sports journalists Graham Dunn and Michael Butler, joined each week by Lindy’s writer/editor and columnist, Lyn Scarbrough. 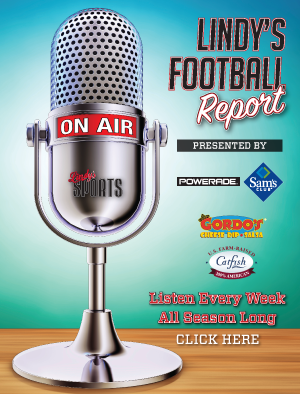 Lindy’s Football Report is heard on 81 stations in 12 Southeastern states. See below for days and times when the show can be heard in each market. Alexander City, AL WKGA 97.5 Sat. 9 a.m.
Auburn, AL WQSI 95.9 Fri. 6 p.m.
Demopolis/Linden, AL WINL 98.5 Fri. 10 p.m.
Dothan, AL WOOF 560/100.1 Fri. 6:30 p.m.
Florence, AL WYTK 93.9 Thurs. 6 p.m.
Foley, AL WHEP 1310 Fri. 6 p.m.
Headland, AL WRMZ 98.1 Fri. 6:30 p.m.
Heflin, AL WPIL 91.7 Sat. 6 a.m.
Huntsville, AL WZZN 97.7 Fri. 11:30 a.m.
Jackson, AL WHOD 94.1 Fri. 6:30 p.m. Mobile, AL WNSP 105.5 Sat. 8:15 a.m.
Monroeville, AL WMFC 99.3/1360 Thurs. 6 p.m.
Montgomery/Selma, AL WDXX 100.1 Fri. 10 p.m.
Red Bay, AL/Corinth, MS WRMG 1430/97.9 Thurs. Thurs. Fri. Fri. Sat. 4:30 p.m. 10 p.m. 6 a.m. 5:30 p.m. 9 a.m.
Scottsboro, AL WWIC 1050 Sat. 9:30 a.m.
Shelby County, AL WAPH 99.9 Fri. 6 p.m.
Tallahassee/Wetumpka, AL WTLS 1300/106.5 Thurs. 6 p.m.
Ozark/Troy/Enterprise, AL WOAB 104.9 Sat. 8 p.m.
Tuscaloosa/Marion, AL WTID 102.9 Thurs. 6 p.m.
Arkadelphia, AR KDEL 100.9 Sat. 9 a.m.
Arkadelphia, AR KVRC 1240 Sat. 9 a.m.
Caddo Valley/Hot Springs, AR KWPS 99.7 Sat. 9 a.m.
Conway, AR KASR 92.7 Fri. 5 p.m.
Helena, AR KFFA 1360/103.1 Sat. 11 a.m.
Little Rock/Benton, AR KAFN 690 Sat. 9 a.m.
Malvern, AR KZYP 1310 Sat. 9 a.m.
Viola/Mountain Home, AR KCMC 94.3 Sat. 8 a.m.
DeFuniak Springs/Panhandle, FL WZEP 1460 Thurs. 5:34 p.m.
Jacksonville, FL WFXJ 930 Fri. 6:30 p.m.
Orlando, FL WYGM 740 Fri. 6 p.m.
Tampa, FL WDAE 620 Sat. 7 a.m.
Athens/Bostwick, GA WMOQ 92.3 Sat. 8 a.m.
Bainbridge, GA WMGR 930 Sat. 7:30 a.m.
Cairo/Bainbridge, GA WBGE 101.9 Sat. 7:30 a.m.
Camilla/Pelham, GA WQLI 92.3 Sat. 7:30 a.m.
Cornelia, GA WCON 99.3 Sat. 12:15 a.m.
Donalsonville, GA WGMK 106.3 Sat. 7:30 a.m.
Donalsonville, GA WSEM 1500 Sat. 7:30 a.m.
Jesup, GA WLOP 1370 Sat. 10 a.m.
Ringgold, GA WAAK 94.7 Fri. 6:30 p.m.
Benton, KY WCBL 1290 Fri. 10:30 p.m.
Danville, KY WKYB 107.5 Sat. 10 a.m.
Lebanon, KY WLSK 100.9 Sat. 10 a.m.
Lexington, KY WVLK 590 Sat. 7:30 a.m.
Manchester, KY WTBK 105.7 Sat. 10 a.m.
Baton Rouge, LA WNXX 104.5 Sat. 7 p.m.
Lafayette, LA WLBW 103.7 Sat. 8:30 p.m.
Ruston/Monroe, LA KNBB 97.7 Fri. 6 p.m.
New Orleans, LA WODT 1280 Sat. 8 a.m.
Farmington/Festus, MO KREI 800 Fri. 5:30 p.m.
Moberly/Columbia, MO KWIX 1230 Fri. 6:30 p.m.
St. Louis, MO KTRS 550 Thurs. 7:30 p.m.
Booneville, MS WBIP 99.7/1400 Thurs Fri. Sat. 10 p.m. 10 p.m. 7:30 a.m.
Centreville, MS WKJN 104.9 Sat. 8 a.m.
McComb, MS WAZA 107.1 Fri. 6 p.m.
Greenville, MS WDMS 100.7 Sat. 11 a.m.
Greenville, MS WGVM 1260 Fri. 7 a.m.
Natchez, MS/Ferriday, LA KWTG 104.7 Sat. 7 a.m.
Picayune, MS WRJW 1320 Fri. 5 p.m.
Starkville/Louisville, MS WLSM 107.7 Fri. Sat. 5 p.m. 10 a.m.
Tupelo/Saltillo, MS WWMR 102.9 Thurs Fri. Sat. 10 p.m. 10 p.m. 7:30 a.m.
Tylertown, MS WFCG 107.3 Sat. 8 a.m.
Vicksburg, MS WVBG 105.5 Fri. 6 p.m.
Yazoo City, MS WBYP 107.1 Sat. 8 a.m.
Baker City, OR KBKR 107.3 Thurs. Fri. 5:30 p.m. 4:30 p.m.
La Grande, OR KLBM 1450 Thurs. Fri. 5:30 p.m. 4:30 p.m.
Greenwood, SC WZSN 103.5 Fri. 6:30 p.m.
Greenville/Spartanburg, SC WCSB 107.7 Fri. 6 p.m.
Ardmore, TN WSLV 1110 Fri. 6:15 p.m.
Milan, TN WTKB 93.7 Fri. 5:30 p.m.
Nashville/Franklin, TN WAKM 950 Fri. 5:30 p.m.
Paris/Camden, TN WRJB 95.9 Thurs. 6 p.m.
Athens, TX KLVQ 1410 Sat 8 a.m.
Graham, TX KWKQ 94.7 Sat. 8 a.m.
Houston, TX KBME 790 Wed. 8 p.m.
Malakoff, TX KCKL 95.9 Sat. 10 a.m.